EA Image Accordion lets you highlight your images with amazing hover and click effects with plenty of styling options. Find the ‘EA Image Accordion’ element from the Search option under the ‘ELEMENTS’ tab. Simply just Drag & Drop the ‘EA Image Accordion’ into the ‘Drag widget here’ or the ‘+’ section. After you are done with step 1, this is the basic layout you are going to view. Under the ‘Content’ tab, you will find the Image Accordion Settings. From the ‘Flipbox Settings’ section, you can use the drop-down menu to choose Accordion Type: On Hover or On Click. You can modify the Accordion Item by changing the Background Image, Title and Content. Switch to the ‘Style’ tab to style all the elements of Image Accordion. You can add Styling to ‘Image Accordion’ and ‘Color & Typography’. From this section, you change the Image Height & Background Color. You can also easily add styling to border, overlay, box shadow and many more. 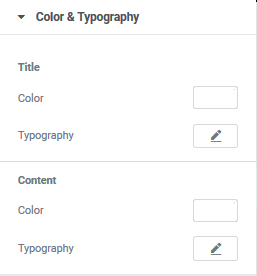 You can easily modify your ‘Title’ and ‘Content’ color & typography from this section. By following these mentioned steps and a bit more modifying & styling, you can easily design your Image Accordion as per your preference. This is how you can easily get started with EA Image Accordion element.